Staff Photo by Dan Henry / The Chattanooga Times Free Press- 4/8/16. 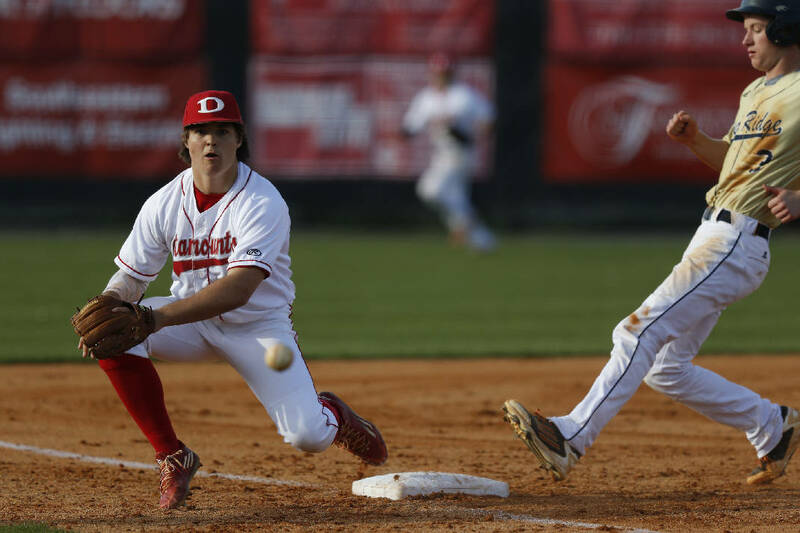 Dalton High School's Cole Shelton (3) dives for a throw to third as River Ridge's nah Fitzgerald (3) rounds the bases at the Catamount's home field on April 8, 2016. Staff Photo by Dan Henry / The Chattanooga Times Free Press- 4/8/16. Dalton High School's Harrison Norman (19) pitches against River Ridge at the Catamount's home field on April 8, 2016. Dalton coach Rhett Parrott watches the game Wednesday, March 16, 2016 during the game at Northwest Whitfield High School. 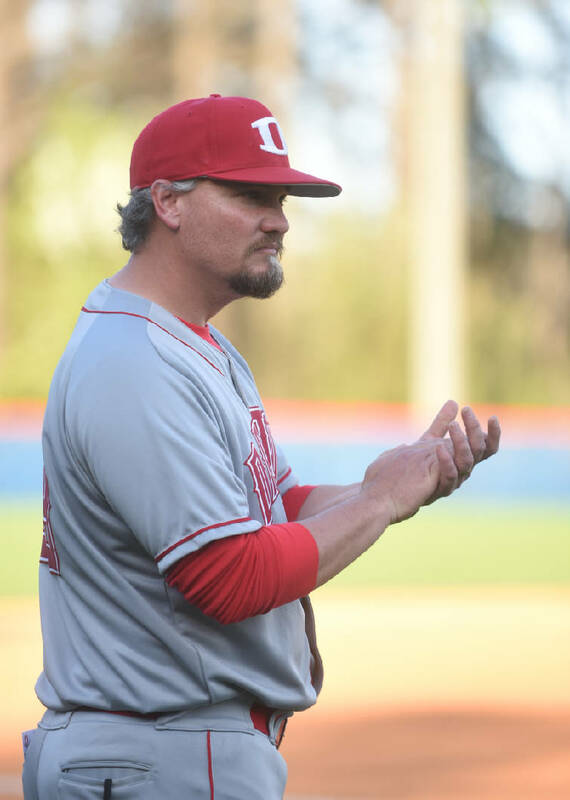 DALTON, Ga. — The Dalton High School baseball team returned to prominence a year ago, winning 24 games and reaching the Class AAAAA state Elite Eight before losing to powerful Gainesville in a tight three-game set. The Catamounts under first-year coach Rhett Parrott accomplished all that without a senior, so, as Parrott knows all too well, the expectations for this season are off the charts in this sports-crazed city. The reality is, however, that matching or exceeding 2016 will be difficult for one major reason: The competition just took a major step forward. Reclassification jumped the Cats to Georgia's Class 6A and into a Region 6 that includes three other programs that made deep playoff runs a year ago. Harrison and Allatoona each won 25 games, while South Cobb made it to the Elite Eight by getting hot late. "It will be tough with Harrison, Allatoona and South Cobb also in our region," Parrott said. "They are teams that typically reload, so it doesn't matter who they graduated. We play some great teams out of our region, and we look forward to testing ourselves against them. "We know expectations are high, but that's what we want. If everybody does their part and executes, we'll be fine." Among Dalton's strengths will be a strong pitching rotation led by senior Cole Shelton, who went 5-1 with a 2.69 earned run average in 2016 while batting .464 with nine doubles, four home runs and 29 RBIs. "We've got a strong lineup back," Parrott said. "Cole has done a great job for us, winning offensive region player of the year last year and doing so well on the mound." The pitching staff also returns lefty Harrison Norman and will get a boost with a healthy Cade Gabriel, who was held back last year by a sore arm. Those two also will work in the outfield along with returners Sam Stepp and Thomas Wright. "Cade had a sore arm and just couldn't get over it, so we wanted to protect that," Parrott said. "He seems to be healthy this year and will help us a lot." Junior catcher J.P. Tighe led the Cats with a .500 average and drove in 27 runs while also having the responsibility of calling all pitches. Leadoff hitter and solid shortstop Maddux Houghton and Harrison Hughes should form a strong double-play combination. "The guys seem to be hungry, and they're ready to accept the challenge," Parrott said. Contact Lindsey Young at lyoung@timesfreepress.com or at 423-757-6296; follow on Twitter @youngsports22.